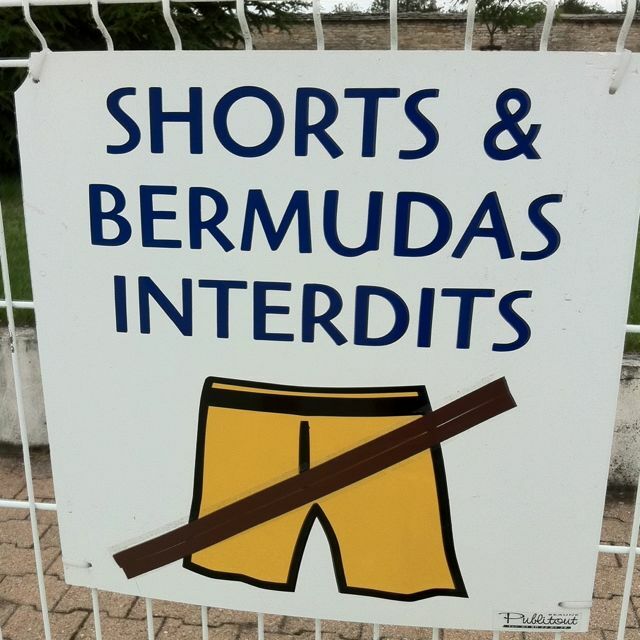 In some circles, artichokes or salad dressing with wine are taboo…I proudly defy this social construct. You may have been told that artichokes or a freshly dressed salad are infamous wine killers because they make wines taste sweeter. But they’re wrong. I find that these two foods can pleasantly transform a too-dry everyday wine into a delicious meal companion. An artichoke won’t Jekyll-and-Hyde your bottle of Sauvignon Blanc into Hawaiian Punch, but it will make the dry Sauvignon Blanc seem less tart and more fruity. This happens because artichokes contain a compound called cynarin which tends to make everything, including water, sweeter. Salad dressing, on the other hand, doesn’t make wine appear sweeter because of any mysterious chemical, but because acidic food subdues acidic wine. Comprised of vinegar, garlic, lemon juice, and other substances that keep the Alka-Seltzer factory fizzing, salad dressing is among the most sour food we eat. 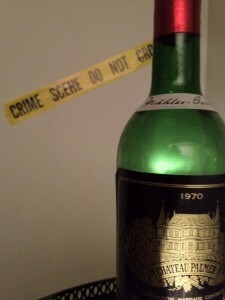 Of course, you might have trouble fully appreciating a delicately balanced mature Burgundy with an endive vinaigrette. But I certainly won’t confiscate your corkscrew if you drink a simple, crisp wine with your dressed-up greens, and I believe that you’ll find the tart dressing is the perfect antidote to an overly dry wine. A very tangy wine like a Sauvignon Blanc or Chianti might very well taste better with an artichoke’s sweetening effects. So, the next time you hesitate before trying these so-called wine killers with a bottle of wine, rethink the vegetable hate and try this unconventional pairing for yourself. For hundreds more fresh, fascinating wine tips, get yourself a copy of my just-released book, How To Drink Like a Billionaire, today. Winemaker Groupie – Is It the Life for You? Nobody raises an eyebrow if they see a fan getting his book or concert program signed. If Meryl Streep or Daniel Craig is asked for an autograph, it is a natural course of events. 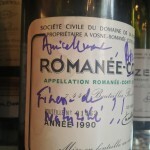 But what of wine and the winemaker: is it ok to ask a vintner to sign to your bottle? 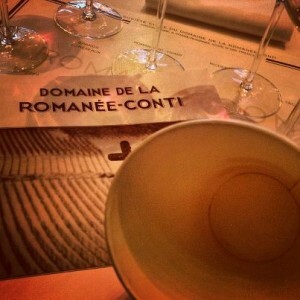 So I pondered during the recent Domaine de la Romanée-Conti media tasting at New York’s A Voce Columbus. The featured speaker was Aubert de Villaine, the courtly French co-owner and winemaker of DRC, widely considered the most sacred Pinot Noir ever to ferment its way into existence. After we tasted through the 2010’s, which included pulse-quickening renditions of La Tâche and Romanée Conti, as well as, of course, the ethically proper abandonment of my spit cup, I threw caution to the wind and approached Aubert. Preternaturally unassuming, he gamely agreed to sign my bottle and did so with an appreciative smile, thereby creating a memento that shall grace my curio cabinet for the rest of my wine-moistened years. Have a good marker ready. 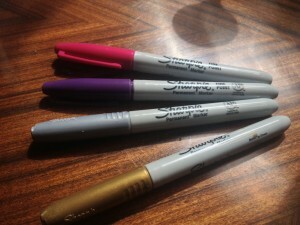 Don’t use just any pen – employ a Sharpie for its permanence and then choose a color such as purple or burgundy to lend visibility and uniqueness. For a dark label, go metallic gold or silver. Have an inscription in mind. 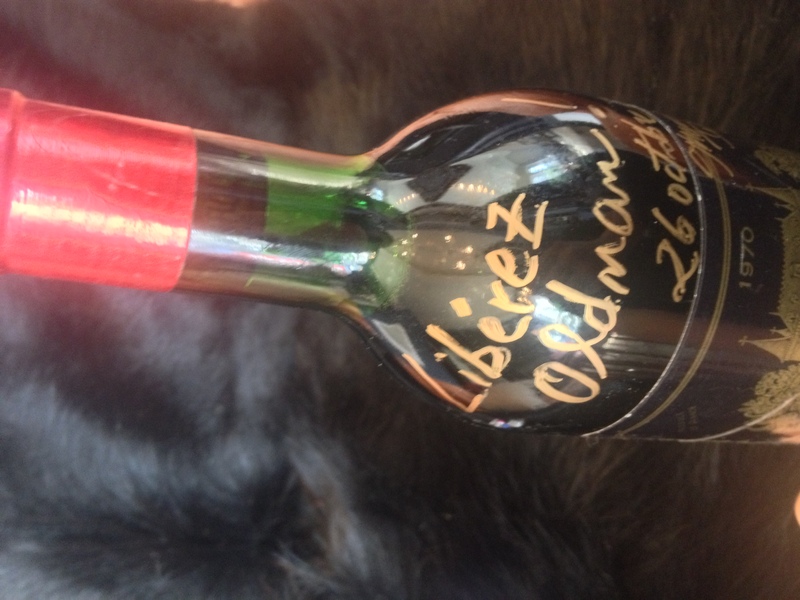 Unlike authors or actors, winemakers don’t necessarily come equipped with witty inscriptions. If you don’t premeditate something for them to write, you might be left with only a lonely signature, which just isn’t making the most of your effort or the bottle’s potential impact. During the tasting, Aubert had talked of how great wine gets that way when grapes can achieve a fine ripeness he called “finesse de maturité”. 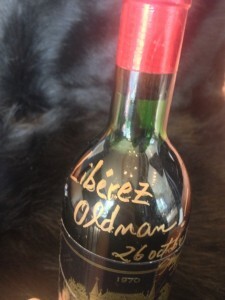 And there, in that poetic phrase, an inscription for my bottle was born. Make it a special bottle. Even if I had wanted to use an empty 2010 bottle from the tasting, I wouldn’t have dared, for fear of freaking out DRC’s importer, Wilson Daniels, whose reps rushed to scrawl an “X” over the label of each emptied bottle so as to discourage counterfeiting. Who can blame them when you consider how connoisseurs have been duped by the likes of scoundrels such as recent faker extraordinaire Rudy Kurniawan; one expert told me that just one empty bottle of Romanée Conti could be worth thousands of dollars on the black market. 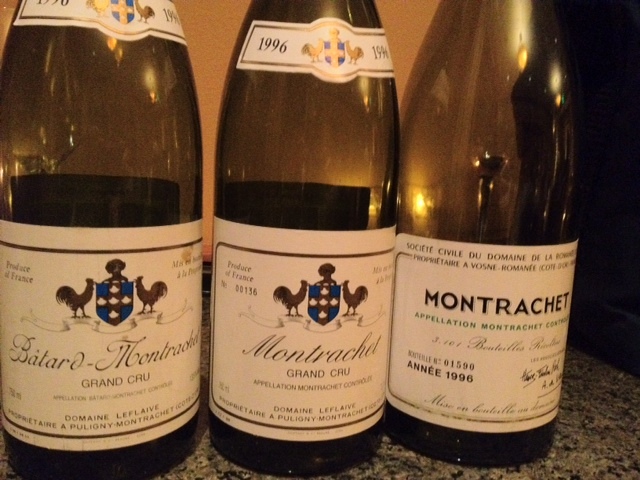 Fortunately a month before this tasting, I took part in a nine-person dinner vinously catered by not one but two legendary collectors. For a grape nut, this is the rarest of planetary alignments, like being afforded access to the music collection of Brahms and Beethoven. 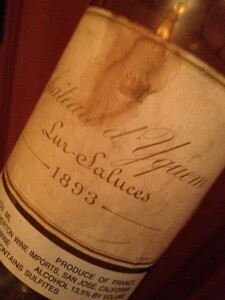 Among his show-stopping offerings the first collector brought the dessert wine Château d’Yquem from the unfathomable vintage of 1893 (incredibly, the middle two numbers have not been transposed) which still had plenty of lemon-vanilla intensity despite its century-topping slumber in glass. 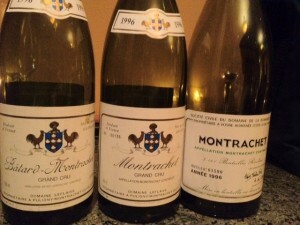 The other collector’s contributions included the 1996 Leflaive Montrachet, one of the rarest and most coveted Chardonnays ever made, and two bottles each of 1990 La Tache and 1990 Romanée Conti, both Picassos of Pinot whose current auction price I resisted Googling for fear of setting my computer’s keys ablaze. The day after this epic repast, I knew that the right thing to do was to ship home one of the empty bottles of Romanée Conti. 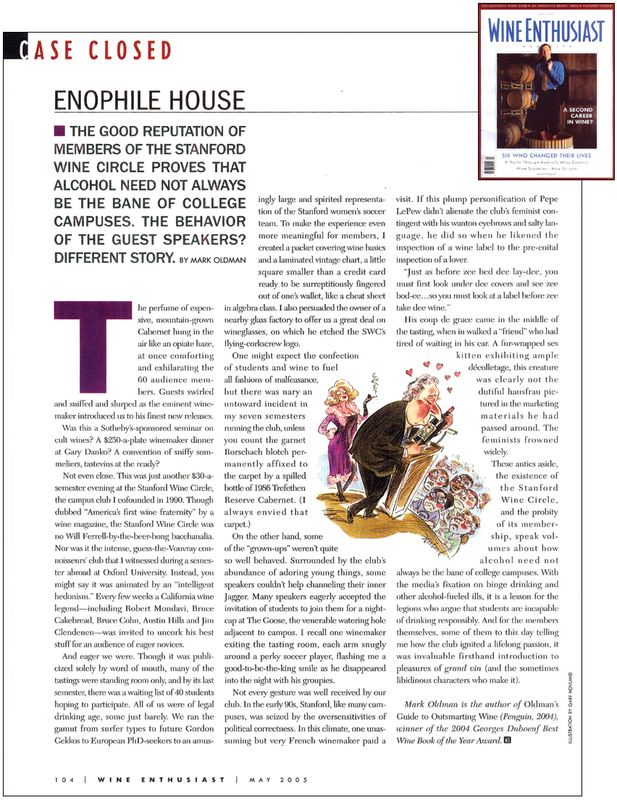 My first foray into winemaker worship happened as a college student when I co-founded the Stanford Wine Circle and convinced the mythic Robert Mondavi to come to campus to lead a tasting of his To Kalon Vineyard Cabernet Sauvignon. 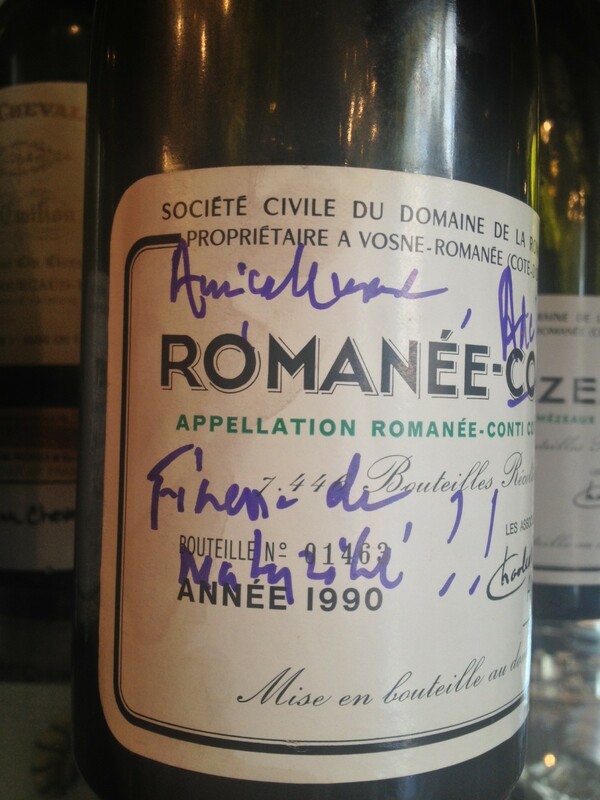 After his presentation, Wine Circle members lined up with the determination of sample-sale seekers to have an empty bottle from this tasting signed by this vintner hero. Bursting with ruddy enthusiasm, Mondavi basked in the attention, any trace of his octenegarian years vanishing in the presence of the event’s adoring coeds. 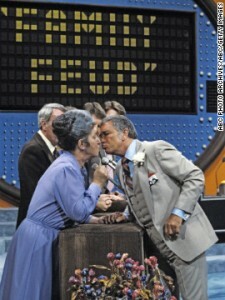 And like a Cab-craving Richard Dawson, he kissed every one of them. My own tribute to the man came in the form of having him sign a bottle of the then-acclaimed 1985 Mondavi Cabernet Reserve, which I had sourced with the help of the winery’s San Jose rep; we located what seemed like the last bottle on Earth hidden under egg grass in the display case of a trinket shop at SFO airport. 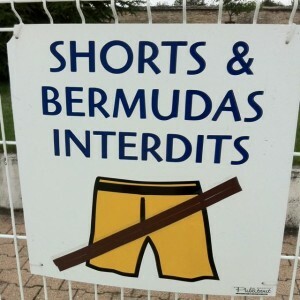 So the message here is not to hesitate engaging in your own winemaker groupiedom. Find a wine you love and discover who is behind it. Visit the winery or attend a winemaker dinner and get your bottle signed with a message meaningful to you. Not only will it pay due tribute to a talented soul, but it will forever bond you to their work. 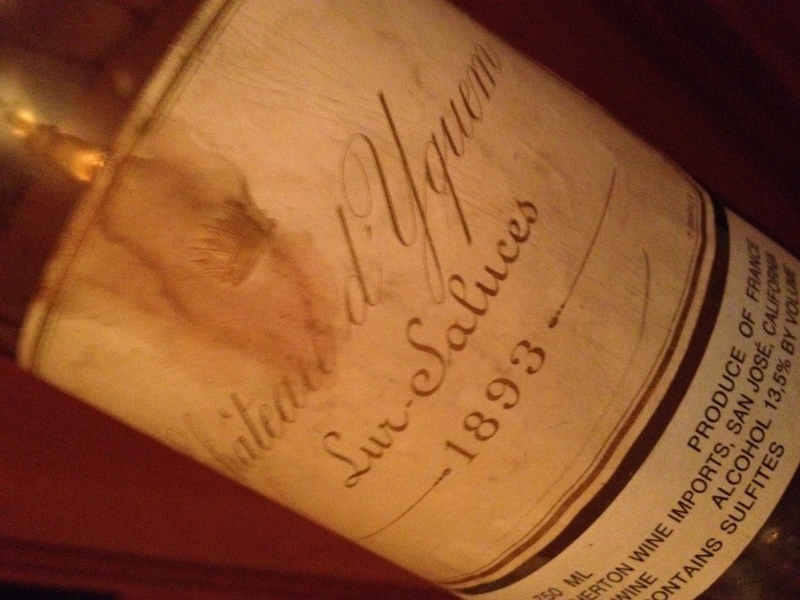 It may also inspire you to follow that wine throughout the years, noticing how each vintage can bring intriguing flavor and texture variations – the observance of which is one of the great joys of wine appreciation. Never forget that winemakers are as deserving of a place on your shelf of memories as any musician or actor. 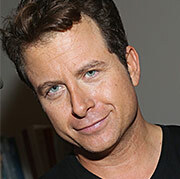 Actually, they might be more deserving, because winemakers aren’t just artists; they are artists who get you buzzed.